Below are a few of the options available for lettering styles. 3D lettering is a combination of Frost Etched and V-Sunk lettering. 3D letters provide enhanced contrast and visibility. 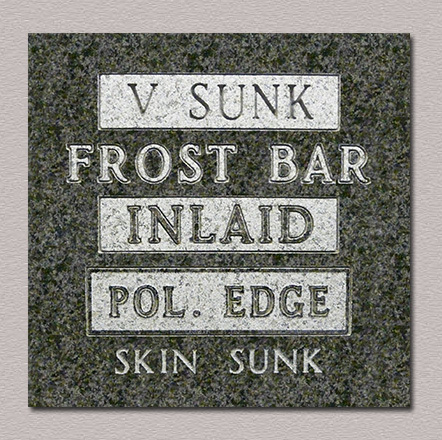 Frost Etched letters are inscribed skin deep and commonly used on darker granite. They do not require a frosted panel leaving the background surface polished. V-Sunk lettering style is the most widely used today. The polish on the stone is sandblasted away and then the lettering is cut deep into the panel. This creates a natural shadowing. Gold leaf is an option to beautify carved lettering and artwork on granite. We use only 24k gold in this carefully applied gliding process. Script Fonts can be uses to make any monument more unique. We can even use your own handwriting. We can provide a number of different options for monument lettering such as V-Sunk, Frost Bar, Inlaid, Polish Edge and Skin Sunk.